Internet boarding pass service enables a faster and more convenient check-in and boarding. 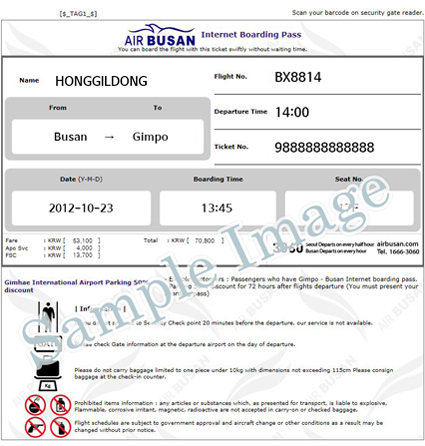 A mobile boarding pass cannot be issued for flights departing from other countries or Daegu (international flights). To use home / mobile boarding pass, it is necessary to complete 3 steps of step 01 before departure. Present the barcode of a boarding pass and passport to gate staff. Please refer to boarding screen or boarding announcements to find out boarding gate information. If you do not enter the departure hall 20 minutes before (domestic) / 40 minutes (international) departure of the aircraft due to on-time departure and waiting process, your boarding will be canceled. Passengers with baggage to check need to proceed to the check-in counter to check their bags before going through the Security GATE. Your home boarding pass is valid only for printed, and copies and damaged boarding passes are not valid. Mobile boarding pass service is offered only to customers with smart phone . Boarding gate can be changed depend on airport’s condition, please refer to boarding screen or boarding announcements. If you need any help, please contact our staff. Flight schedules are the conditions approved by the government and boarding gates and seat numbers may be changed without prior notice for unavoidable reasons such as airport situations and airplane changes. If you cannot print your boarding pass or send to your mobile phone due to any technical problem, please check-in at the counter at the airport. 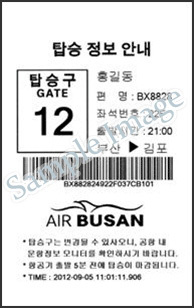 AIR BUSAN is not responsible for any damages to your internet boarding pass that is lost, stolen or falsified. If you have to reissue your internet boarding pass, please go to [Purchase/change additional service]- [Seat assignment]-[Print internet boarding pass] or [send mobile boarding pass] .